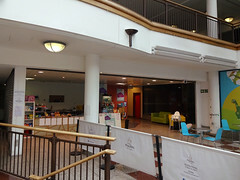 Cafe and children's soft play area on the lower level of the Whitgift Centre. It was previously run by Beanies photo, which moved here from 3-7 Middle Street around the end of 2014. However, Beanies closed some time in 2018. By October 2018 the space had been taken over by Priscilla's. Last edited 2019-03-08 15:09:48 (version 12; diff). List all versions. Page last edited 2019-03-08 15:09:48 (version 12).